Difficulty meeting developmental milestones such as rolling, sitting, crawling, walking, etc. Motor planning needed for skills such as riding a bike and stair climbing. Gross motor skills which are needed for successful mobility, play, and sports. Physical recovery from injury or surgery. Range of motion, strength, and normalizing muscle tone through the use of therapeutic activities, NDT, MFR, splinting and taping. Orthotics to maximize posture and balance. 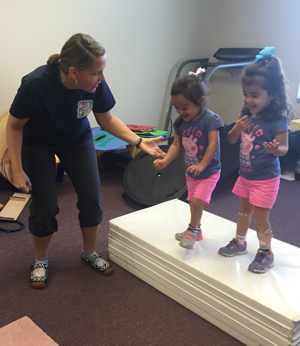 Our Physical Therapists collaborate with your family, physicians, and other specialists to support your child’s rehabilitation and development. We set appropriate goals and provide therapy in an environment which is positive, compassionate, and child-friendly. Physical Therapists at Coordinated Movements routinely attend continuing education classes which focus specifically on pediatrics. By attending child specific continuing education therapists stay up to date on treatment techniques to help children reach their maximum level of independence. We are happy to have therapists who have taken courses and have specialty certifications.